Whether you’re looking for some daily inspiration, or a new Instagram caption, Wear Gratitude (Like A Sweater) is the book for you. The words and art created by Susa Talan will give you a positive perspective on life, and allow you to use real wisdom as a form of thoughtful insight and encouragement. Great as a present or as a gift for yourself, start 2016 off with positivity. Who else can create your own happiness, other than you? 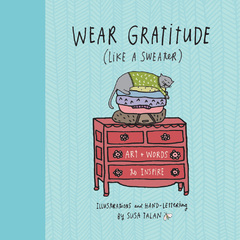 Susa Talan’s hand-drawn lettering and playful illustrations animate the wisdom of beloved writers and thinkers such as Virginia Woolf, Rumi, Lao Tzu, Walt Whitman, Thich Nhat Nanh, Ralph Waldo Emerson, and Henry David Thoreau in Wear Gratitude (Like a Sweater). This gem of a book inspires laughter, contemplation and especially joy in readers of all ages. Susa’s own words and insights about the sweetness and challenge of being alive, loving, and finding meaning in the world, contribute a fresh voice, and updated perspective to the tradition of philosophical art. Richly designed and illustrated, these artful meditations will appeal to young and mature audiences alike, and bring a fresh voice to an ongoing conversation about how to live well in a fast-moving world.